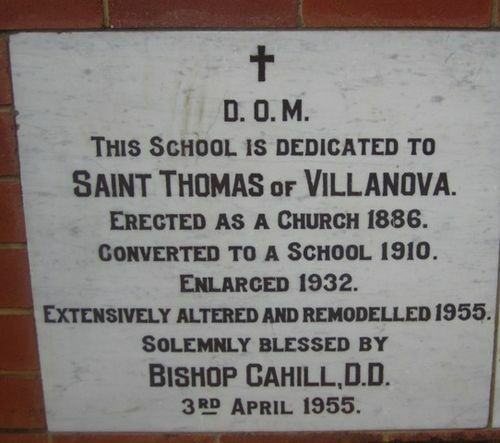 The School is dedicated to Saint Thomas of Villanova (1488 -1555). The building was originally a church which was converted to a school in 1910 and extensively altered and remodelled and blessed in 1955. St. Thomas of Villanova O.S.A. (1488 – 8 September 1555) was a Spanish friar of the Order of Saint Augustine who was a noted preacher, ascetic and religious writer of his day. He became an archbishop who was famous for the extent of his care for the poor of his see. He received a superior education at the University of Alcala and became a popular professor of philosophy there. After joining the Augustinian friars at Salamanca he was ordained and resumed his teaching–despite a continuing absentmindedness and poor memory. He became prior and then provincial of the friars, sending the first Augustinians to the New World. He was nominated by the emperor to the archbishopric of Granada, but refused. When the see again became vacant he was pressured to accept. The money his cathedral chapter gave him to furnish his house was given to a hospital instead. His explanation to them was that "our Lord will be better served by your money being spent on the poor in the hospital. What does a poor friar like myself want with furniture?" He wore the same habit that he had received in the novitiate, mending it himself. The canons and domestics were ashamed of him, but they could not convince him to change. Several hundred poor came to Thomas's door each morning and received a meal, wine and money. When criticized because he was at times being taken advantage of, he replied, "If there are people who refuse to work, that is for the governor and the police to deal with. My duty is to assist and relieve those who come to my door." He took in orphans and paid his servants for every deserted child they brought to him. He encouraged the wealthy to imitate his example and be richer in mercy and charity than they were in earthly possessions. Criticized because he refused to be harsh or swift in correcting sinners, he said, "Let him (the complainer) inquire whether St. Augustine and St. John Chrysostom used anathemas and excommunication to stop the drunkenness and blasphemy which were so common among the people under their care." As he lay dying, Thomas commanded that all the money he possessed be distributed to the poor. His material goods were to be given to the rector of his college. Mass was being said in his presence when after Communion he breathed his last, reciting the words: "Into your hands, O Lord, I commend my spirit." Thomas of Villanova was already called in his lifetime "the almsgiver" and "the father of the poor." He was canonized in 1658. Erected As A Church 1886. Converted To A School 1910. Extensively Altered And Remodelled 1955. During The Years 1965 - 1975. By HIS LORDSHIP JOHN A TORPIE, D.D.